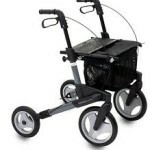 The rollator is a sturdy frame with three or four large wheels, handlebars and a built-in seat, which allows the user to stop and rest when needed. 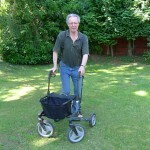 Rollators are also often equipped with a shopping basket. 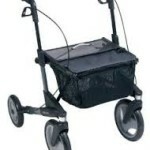 Rollators are typically more sophisticated than conventional walkers with wheels. 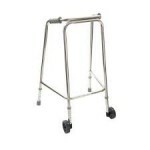 They are adjustable in height and are light-weight, yet sturdier than conventional walkers. 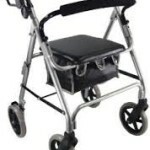 The handlebars are equipped with hand brakes that can be lifted or pushed downward to instantly stop the rollator. The brakes can also be used in maneuvering the rollator; by braking one side while turning the rollator towards that side a much tighter turning radius can be achieved.